Despite how it sounds, the MAC address has nothing to do with Apple, Macs, or Macintoshes. 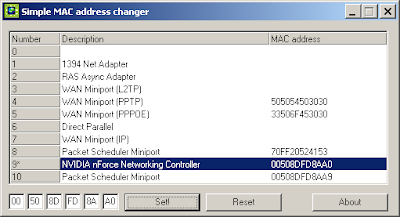 A MAC address is just a series of numbers and letters that identifies your Network Interface Card (NIC), which you are probably using to connect to the Internet. So why would you want to change it? Your ISP might use your MAC address to identify computers that are authorized to use its services. If you change your NIC or want to use a different computer to access the web, your ISP might not let you. Since the MAC address is a unique identifier, organizations like the RIAA and MPAA go after file sharers by listing MAC addresses in their lawsuits. It probably isn't a foolproof way to hide from the RIAA by changing your MAC address, but it might be worth a try. There are several programs out there that let you change your MAC address, but most aren't free. Select your network card. The series of numbers and letters in the lower left identify your MAC address. You can replace these with a sequence like 00DEADBEEF01. Enter it in two at a time. Click Set! to change your MAC address. If you want to restore your original address, click Reset. Of course, the easiest way to hide from the RIAA is to simply not share copyrighted music in the first place. Instead, check out this list of free, legal music download services.